The Dixie Dude- 6 flavors of our gourmet pecans including cinnamon, chocolate and our popular praline pecans! The delightful 6-way sampler features our most popular gourmet pecans. 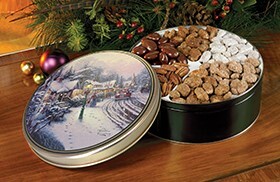 These delicious selections come packed in a beautiful gift tin. It’s the perfect selection for anyone on your list. 3 lb. 4 oz. From Anonymous of Owensboro, Kentucky on 5/27/2009 .